Ethylamine is used in the preparation of dimethylolethyltriazone (textiles), 1,3-diethylthiourea (corrosion inhibitor), herbicides, rhodamine dyes, alkyl isocyanates (manufacture of pharmaceuticals and resins). It can be applied as a stabilizer, catalyst, dyestuff intermediate, solvent, deflocculating agent and in the manufacture of detergents. 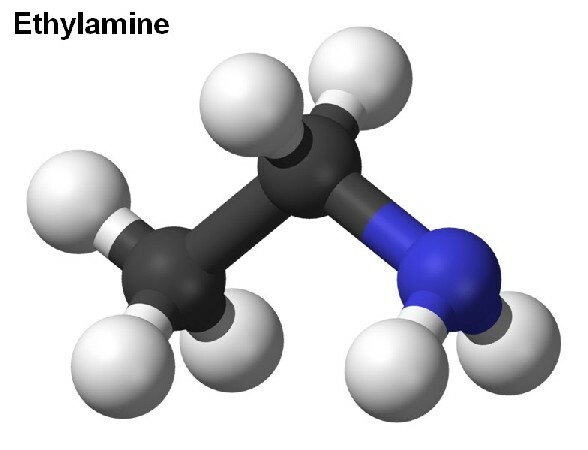 Ethylamine is a colorless/light yellow liquid with a strong ammonia-like odor. It is incompatible with oxidizing agents, alkali metals, alkaline earth metals, acids, isocyanates, halogenated organics, peroxides, phenols (acidic), epoxides, anhydrides, and acid halides, cellulose nitrate. Miscible with virtually all solvents. It can be used in the synthesis of alkyl isocyanates to be used in the manufacture of pharmaceuticals. It is used as a raw material in the synthesis of herbicides like Atrazine, Simazine and Cyanazine. Ethylamine has the application in the production of Polyurethane foam, as a catalyst. It acts the role of an intermediate/a catalyst in the production of Ethylcyanopyrolidone disperse and in the manufacture of rhodamine dyes. It is used in leather-tanning, also as a synthetic reagent in the manufacture of Dimethylolethyltriazone condensate used for Wash and Wear agent for cotton fabrics. It can be applied as a vulcanization accelerator for sulfur cured rubbers.